Many surveys have indicated that uptime is number one factor when choosing a web host and although most, if not all, web hosting services “promise” 99.99% uptime, it’s not the case with our case-study. According to our latest research, the average uptime of 32 shared web hosting providers is 99.59%. That’s approximately 35 hours 32 minutes of downtime per year, per website. And downtime even happens to online giants. A Dun & Bradstreet study found that nearly 60 percent of Fortune 500 companies experience a minimum of 1.6 hours of downtime every week. As a rule of thumb, if you are experiencing and uptime of 99.90% or below, you should switch your web host. A good web host should provide you with an uptime of at least 99.94%. If you don’t know your uptime, we recommend using website monitoring tools. * comes with uptime guarantee. If they’ve failed promised uptime, you can ask your money back. Although MidPhase doesn’t mention any uptime guarantee on their website, they are the clear winner of this case-study hitting nearly 100% uptime in 2018. Similarly to MidPhase, Bluehost doesn’t offer any uptime guarantees either (just a network/server uptime agreement). However, their servers have been working very steadily, with the exception of one bigger outage (42 minutes). DigitalOcean is a cheap cloud hosting that promises 99.99% uptime which they have greatly succeeded in our test. If you see uptime less than 99.99% using DigitalOcean, you can ask your money back. SiteGround is a hosting provider with an excellent uptime score. They also offer uptime guarantee, providing you with one month of free service if uptime falls below 99.99% and an additional month if uptime falls below 99.90%. HostGator comes with a decent uptime. On top of that, they even provide an uptime guarantee of 99.9% and you get credit back when it falls below. Just beware that it only applies for the actual server downtime excluding server maintenance. ASmallOrange offers an uptime guarantee of 99.9%. When it’s below that, you get a refund of one day of service per every 45-min downtime. Beware of the specific clauses. Just note the high number of outages we experienced in the test period. iPage does not offer an uptime guarantee. Luckily, considering their ranking in overall uptime, we’re pretty sure you wouldn’t need it anyway. One thing to be aware of is the high number of outages we experienced. Even though they mention under their Terms of Service using “reasonable efforts to maintain 99.9% of uptime”, HostPapa does not exactly provide an uptime guarantee. Even though their live chat agent said that they guarantee a 99% uptime, there is no official uptime guarantee on FastComet’s Terms of Service or refund/credit policy if it falls below what’s promised. The total amount of outages is somewhat concerning. For every 15min of downtime, LunarPages credits client’s account with an equal of a full day of service. That guarantee excludes scheduled maintenance. Hostinger’s above average uptime is backed up by their uptime guarantee of 99.9%. As in all cases, scheduled maintenance is excluded. WHB does not provide any uptime guarantee per se. Based on our experience, you most likely wouldn’t need one anyway. GreenGeeks offers a 99.9% uptime guarantee. However, it only applies to their own servers and is not applicable for client errors. There’s no uptime guarantee on their website, whatsoever. Despite their big name, huge client-base and decent service, GoDaddy does not provide any uptime guarantee. You should also beware of their rather high number (compared to other top hosts) of outages. HostRocket has an official 99.5% uptime guarantee. Like others, it only applies for their own direct services. Even though you can find a statement claiming to strive for their best, there is no official uptime guarantee. They offer a service uptime guarantee of 99.9%. It’s solely determined by them and you get 5% of your monthly hosting fee as credit back. It’s only usable to purchase further service of products from Hosting24. 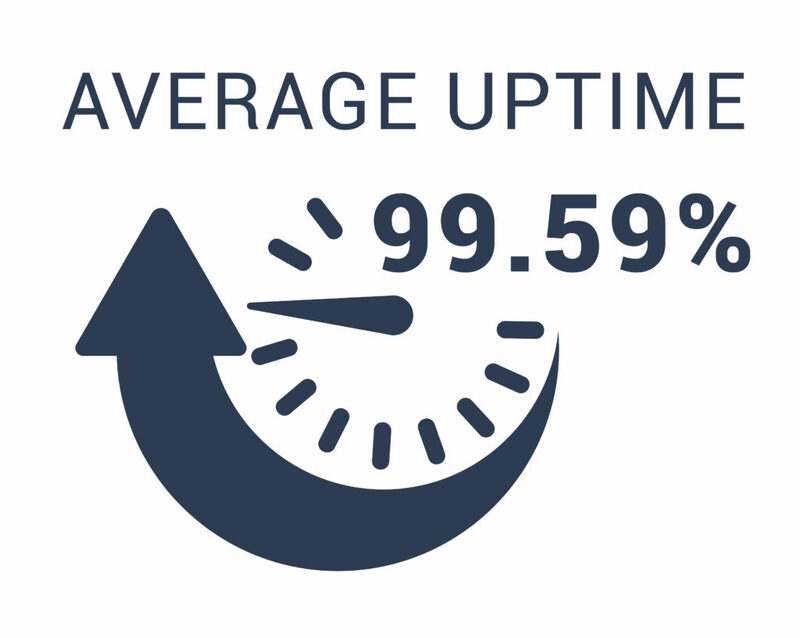 At close investigation, we found a 99.9% service uptime guarantee. When outages happen which are directly related to WestHost, you get a credit of 5-100% of your monthly hosting fee depending on the total downtime. WHH claims on their front page to have a 99.9% uptime guarantee. Unfortunately, we did not find an official guarantee under their terms of service and other binding policies. Uptime guarantee only applies to Business Pro accounts. Even though it’s a really sweet one (99.999%), there is no uptime guarantee for other hosting plans. A2 comes with a 99.9% uptime commitment. Similarly to other hosting providers, when it comes to credit, there are clauses related to server maintenance and the outage being not-their-responsibility. When the total uptime in a year is less than 99%, you get a 1-month service for free. They have an official 1000% service uptime guarantee (it’s not as cool as it sounds). It doesn’t seem that uptime is one of the strengths of FatCow – despite our research, we did not find any uptime guarantee. NameCheap offers one full day of service for every 1h that your server is down in a month. Beware that the first 45min are not applicable. An uninspiring total uptime is even further disappointing as there is no uptime guarantee under their ToS. A day without service is a serious issue by itself. Despite our serious efforts, we could not find any uptime guarantee either that would make you eligible for at least some credit. There is a 99% official uptime guarantee. However, it’s most likely that you wouldn’t really care about the few free days you get when the service performance is this bad. Despite their bad performance (the worst ever, by far, anywhere…), Arvix actually does have an official uptime guarantee of 99.9%. But does it really matter to get a refund or some credit when your website has lost all its traffic because of its non-existent performance? In order to find out the average uptime of web hosting industry, we purchased shared hosting plans before 2018 and started to monitor them via Pingdom. These are the uptime figures of 1st of January 2018 to 31st of December 2018. As a result, we found out that average uptime of 32 web hosts is ~ 99.59% and ~35 hours of downtime.